Good morning friends! 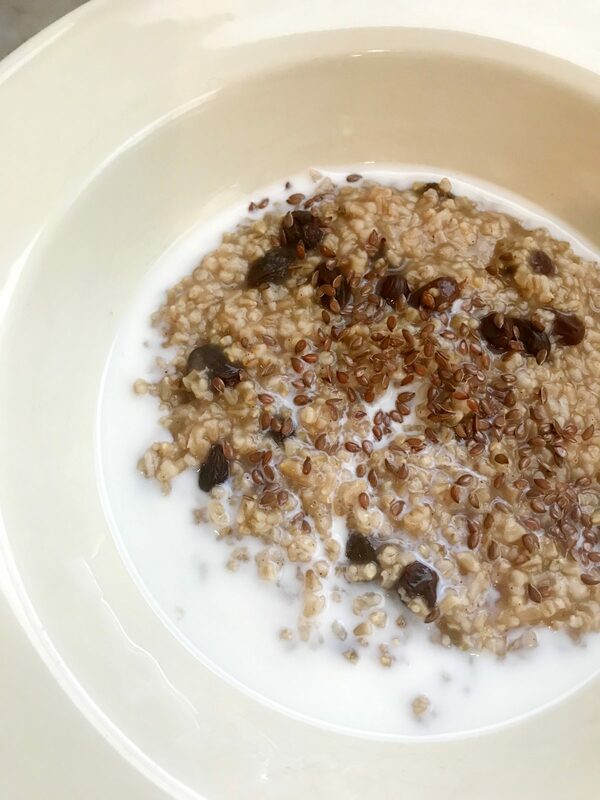 It’s been a while since I’ve given you the lowdown on what I’ve been eating and it’s a question I’ve been getting a lot lately, especially after the swimsuit dressing room post, so I’m happy to share my typical daily meals with you! When I was in my 20s, I could eat whatever I wanted and it never seemed to affect my shape. #thosewerethedays Now that I’m in my 40s, it’s another ballgame for sure! I have a pretty big sweet tooth, but I’ve noticed that when I indulge too much, it definitely shows up on the scale! Trust me, my body isn’t perfect- especially after two kids, but I’ve always appreciated a fit, athletic physique and that’s what I strive to maintain. Even though working out with weights, doing cardio, and stretching is important to your overall health and fitness, what we put in our mouth is probably even more important! 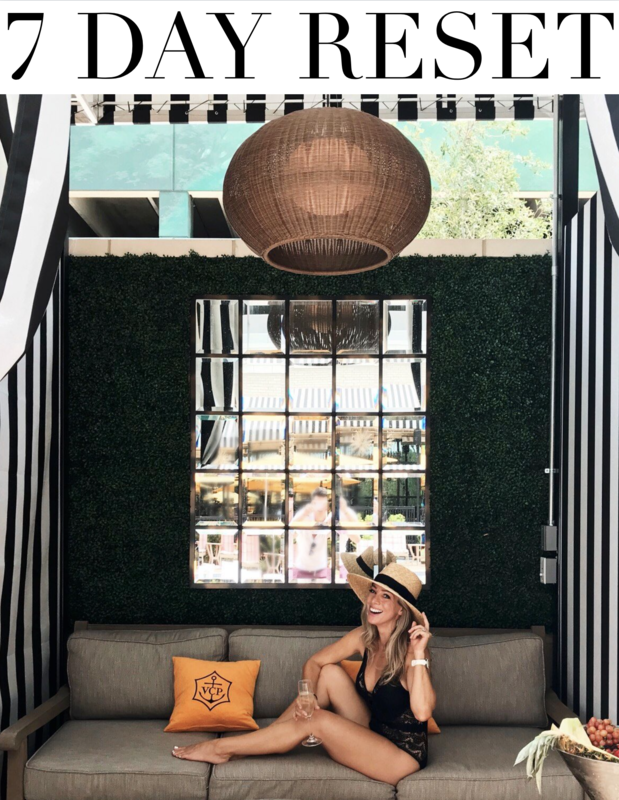 Today I’m sharing what I typically eat in a day and this post is also in collaboration with Zella at Nordstrom, so you’ll get a double dose of fitness and fashion in this one! If you’ve been here for awhile, you know I like to wake up early to workout. The dilemma is that I can’t workout on an empty stomach, but I’m not ready at 5:30 in the morning to eat a big breakfast. What I’ve been doing for years, is getting up and drinking 1 cup of Muscle Egg. It’s flavored egg whites and sounds gross, but it’s pretty much like drinking chocolate milk. One cup has 26 grams of protein. You can make your own at home with skim milk, egg whites and sugar free chocolate syrup, but I prefer the convenience of buying it pre-made. Top Fit: It runs TTS, I’m wearing XS. I was immediately drawn to the sunshiny yellow in this mesh tank. It’s impossible to have a bad working in a tank so cheerful! It’s cool that you can shop Nordstrom activewear not only by category, but also by activity type, brand, price or COLOR! Bra Fit: It runs TTS, I’m wearing S. You can’t see my sports bra through the top, but it’s a moderate workout bra, suited more for low impact sports like weight lifting, pilates and yoga. The double straps are a fun detail and the pale aqua is so pretty! Shorts Fit: It runs TTS, I’m wearing XXS, but should have gotten an XS. These shorts are awesome for running and are lined with a tulip hem and comfortable, wide waistband. They’re also reflective if you run outside when it’s getting dark or the sun is just coming out. It only takes me a minute to drink it and sometimes I’ll put it in a to-go cup and drink it on the way to the gym. It’s just enough to get me through my workout with energy. After I come home, I’ll usually shower, then eat my breakfast with Jordan. 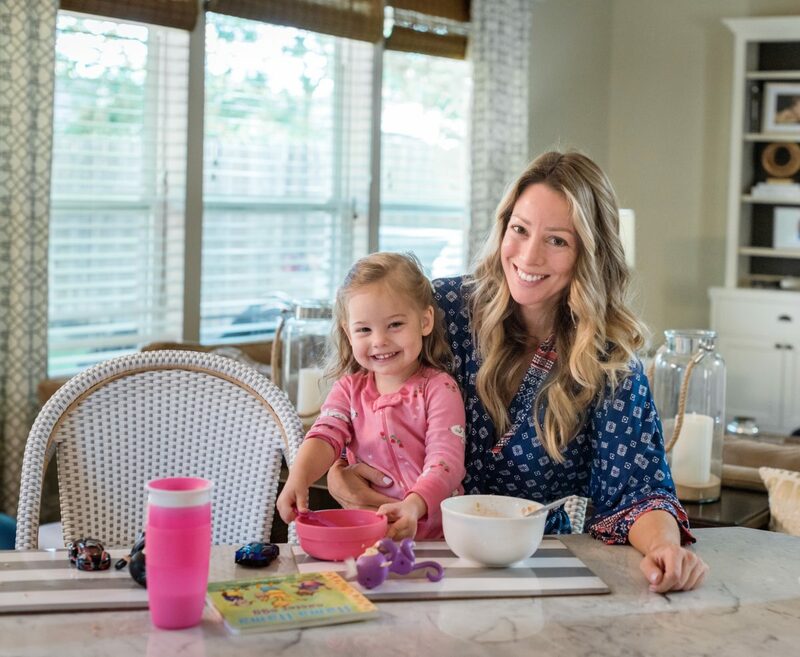 She’s a great eater and breakfast companion! Breakfast is either oatmeal or a protein pancake. I eat this almost everyday of my life, perhaps switching it up on the weekends for bacon and eggs or if I’m not that hungry, toast with butter and jelly. My toast is typically on whole wheat bread or this Power Seed bread that’s light but filling. Ever since I organized my pantry, it’s much easier to pull out the ingredients I need to make oatmeal. This makes about 6 servings. Jordan and I eat it for about 3 days, just microwaving it to reheat. I was adding whole flaxseed to mine, but realized I needed to grind them to get the benefits- but mostly I like the crunch. So, I’m back to adding toasted almonds to mine and a splash of almond milk. It seems regular milk and ice cream are upsetting my stomach these days, so I switched to almond milk. It’s especially yummy in oatmeal. By 11:30, I’m ready for lunch and because I work from home, I like to eat lunch with Jordan. 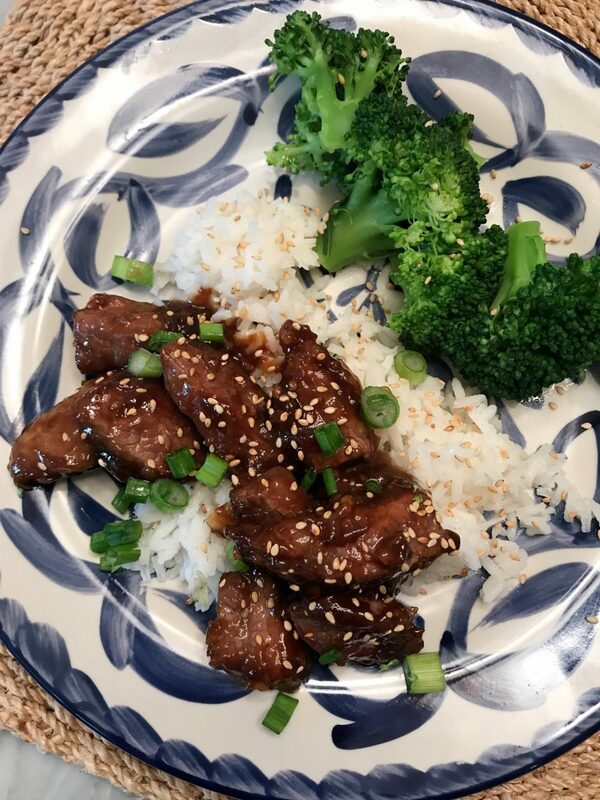 My favorite is when I have dinner leftovers I can heat up for lunch! Recently, I made a Vegan Enchilada Casserole for dinner and it reheated beautifully for several days after! It was more like a chili than a casserole and also yummy (and non-vegan) with sour cream on top- and tortilla chips! 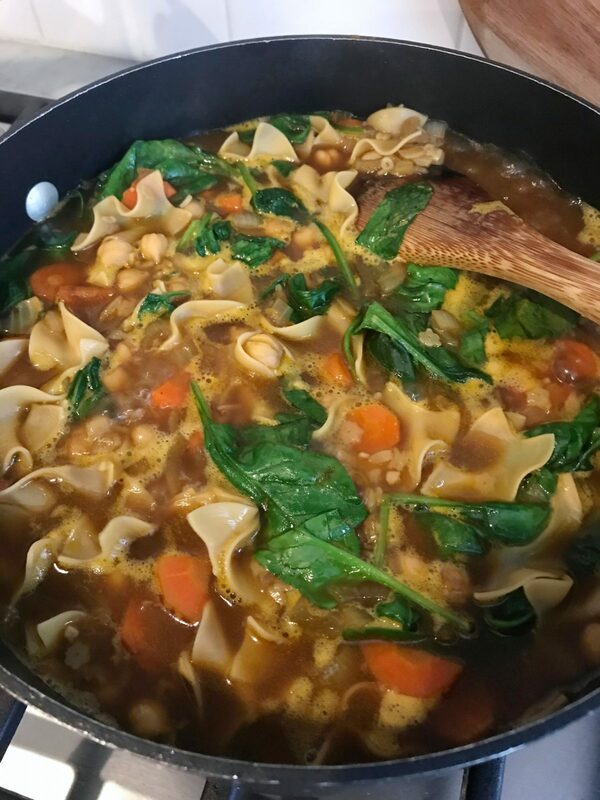 This is one of those tasty meatless meals that still has lots of protein in it because it has black beans, red lentils and quinoa. Top Fit: It runs a little large, I’m wearing XXS. I like a lightweight top to wear over my sports bra when it’s on the cool side out. This one is comfortably thin with a cute cutout in the back. Bra Fit: It runs TTS, I’m wearing S.
Leggings Fit: It runs TTS, I’m wearing XS. These are my go-to leggings with a high waist and mesh panel. Nordstrom has been carrying these forever and I hope they never go out of stock! I like the crop length because I tend to get too hot in long leggings unless it’s really cold out! By the way, I get lots of questions about our low microwave. It works fine for me because I’m a shorty and can just bend over, but the other alternative was to put it up with our cabinets and that would’ve been too high for me. Our kids were initially interested in pushing the buttons, but they’ve learned to leave it alone. 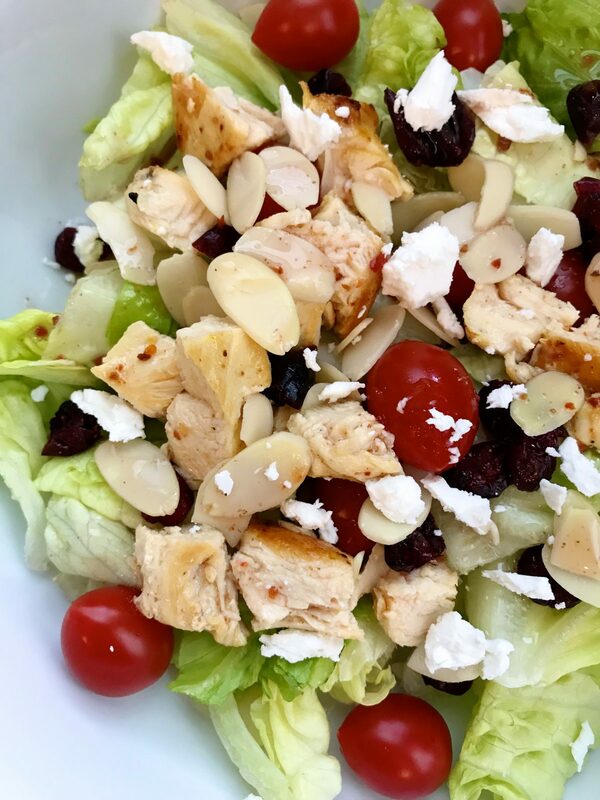 If I don’t have leftovers to eat, my go-to lunch meal is a grilled chicken salad. I always have grilled chicken on hand and I’ll mix in whatever we have to top it with. I also love chickpeas in a salad! 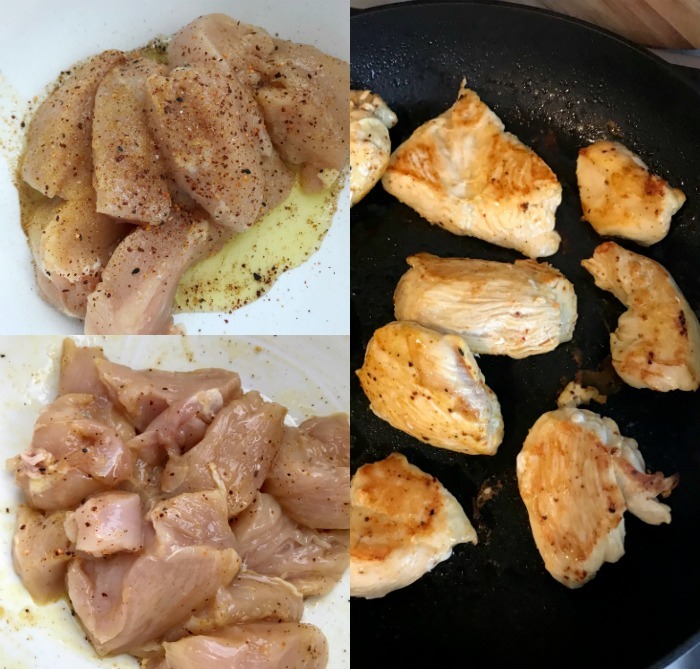 Before grilling my chicken (I typically use chicken tenders because they cook extra quick and evenly), I’ll marinate it in seasonings and olive oil so it has more flavor. I cook it over medium-high heat for about 5 minutes per side. Then let rest before slicing. If you want to grill a big batch of chicken breasts, this is how we do it, keeping them nice and moist! Here’s the dressing I like- it’s sweet, but not too sweet! I go through phases with snacks, like peppers/carrots with hummus, Greek yogurt with fruit and granola, but right now I’m hooked on apples and peanut butter. Bra Fit: It runs TTS, I’m wearing S. I like this bra for the higher neck because I feel all tucked in, but it’s not at all uncomfortable. Joggers Fit: It runs TTS, I’m wearing XXS. I’m crazy for these joggers! They are the perfect lightweight material and great for running around or exercising. They have a wide drawstring waistband and pockets. I wear them at home, running errands, to ball games, and just about anywhere you need pants! I like them so much, I have them in both colors! Jordan loves this snack too! But we’re also big fans of fruit- James too, so I like to keep the basics like oranges, bananas, strawberries and blueberries on hand. The way I was taught to keep your berries fresh is to wash them in a vinegar bath. Put the berries in 2:1 water to vinegar and let soak for about 5 minutes. 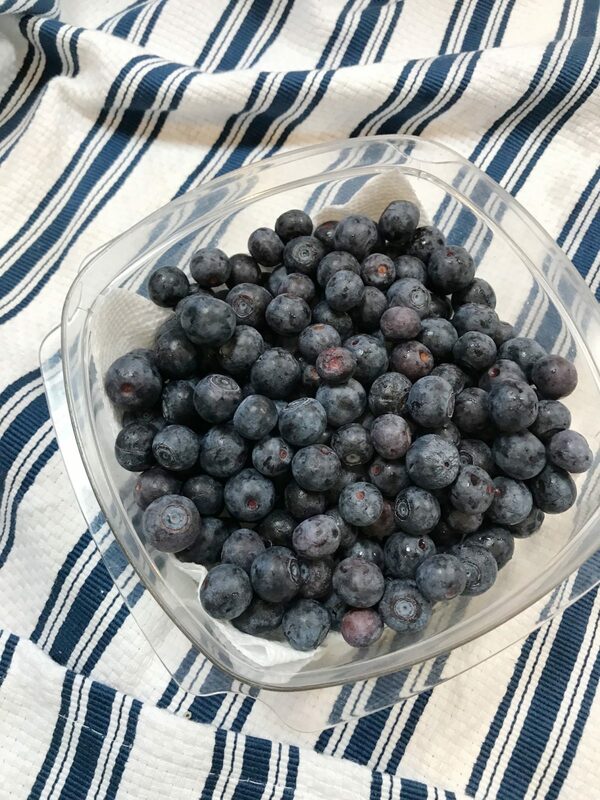 Place the berries in a colander and rinse with water. Let the berries dry on a towel. Line your storage container with a paper towel and put the dry strawberries inside with a lid. The berries should last up to two weeks! It works for blueberries too! I’m in a good groove of meal planning on Saturday mornings, and grocery shopping on Saturday afternoons. But, I recently reorganized my Recipe Binder and that’s made a world of difference. I try to include veggies and make some meatless meals. 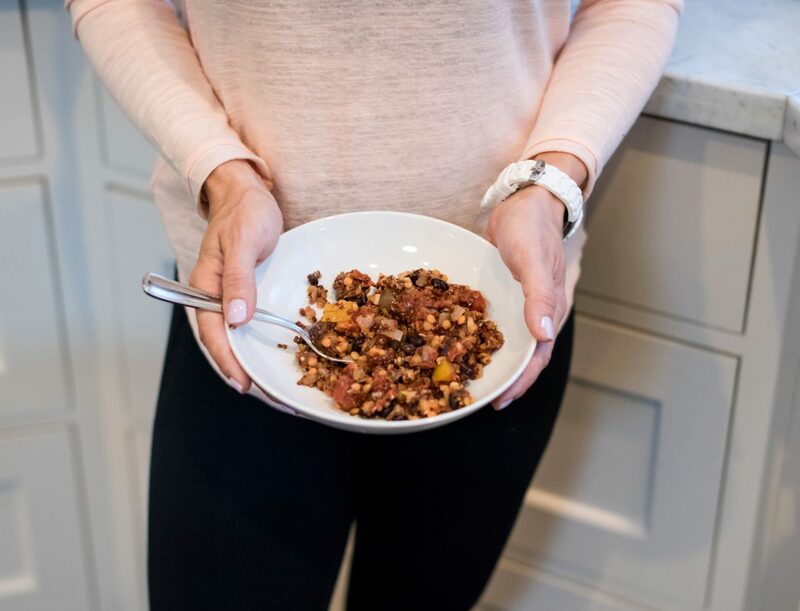 But, I know protein is important, so for those meatless meals, I like to incorporate beans, lentils, chickpeas, or quinoa- all great sources of protein! Below are a few examples of meals that are hits in our house. 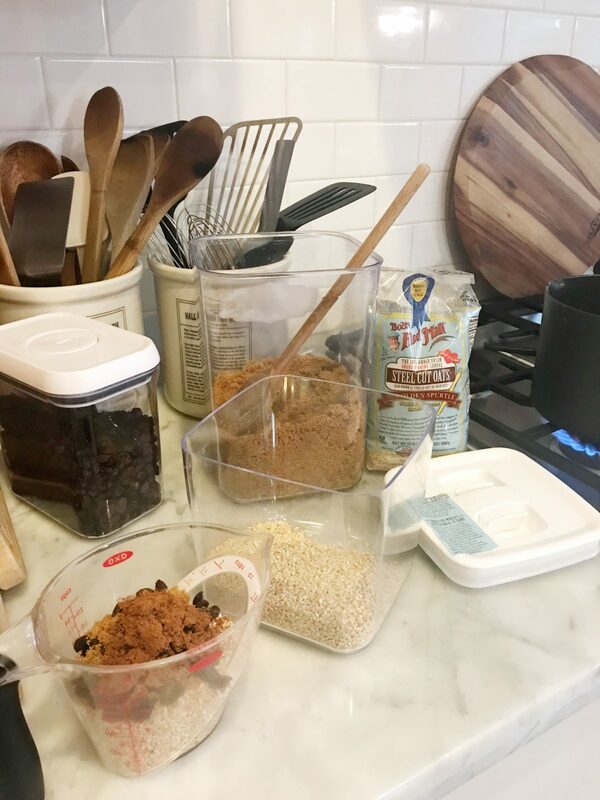 You can subscribe to my newsletter for a new recipe every week that’s been HWH approved at our table! Sometimes we will just have grilled veggies and potatoes! Chop up the veggies, sprinkle with seasoning and olive oil and roast them in the oven until cooked through and crispy! And one more pic of the joggers since they are at the top of my ‘athleisure’ list! See how cute they are for running around in?! I hope this post was helpful! After I typed it all up, I worried that my meals are so boring because I eat the same thing over and over! But that’s what I like and what works for me! And I should mention, I never go without my coffee and creamer . 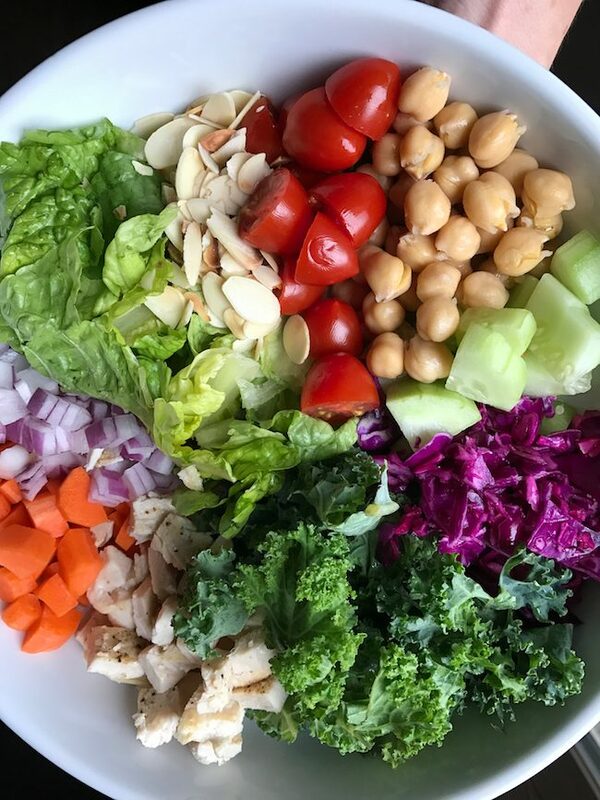 . .
I’d love to hear what some of your go-to healthy meals are! I’m sure we could all use some more ideas! And thank you to Nordstrom for sponsoring today’s post. I appreciate that they provide creative freedom so that I can bring you the kind of meaningful content I want to provide, while still featuring their top quality fashion brands, like Zella. It’s one of the reasons I enjoy working with them so much! 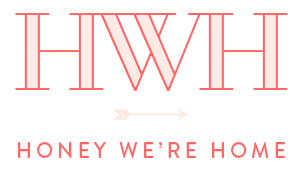 Thank you, dear readers, for supporting the brands that make this blog possible. Great post! I’m always interested in healthy eating and getting more ideas. I tend to eat the same thing over and over and am currently hooked on peanut and almond butter. That can be dangerous! I’ve gone back to oatmeal for breakfast but have a problem with snacking (which I never used to have). Please keep up the healthy eating posts. I always enjoy your blog. I tend to eat the same thing over and over also! 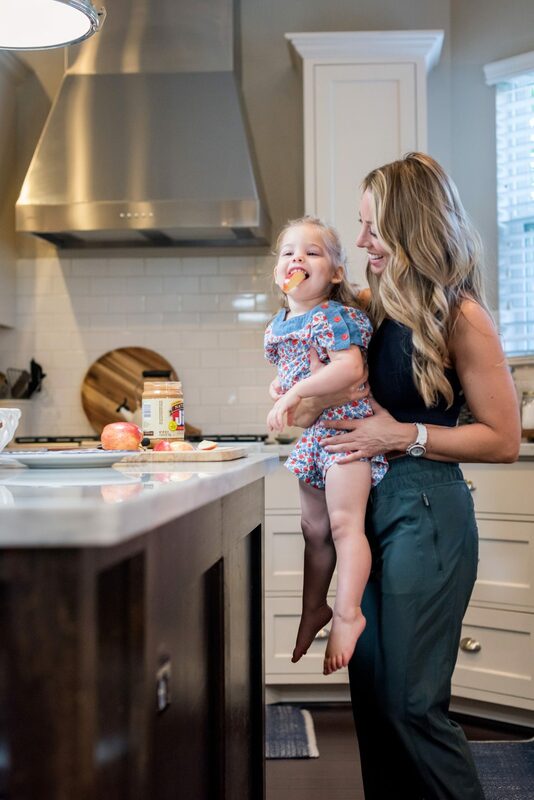 I’ll usually use those little to-go peanut butters- the natural ones and share with Jordan so I don’t eat too much! Great post! I have a very bad habit of grazing at night. How do you keep from snacking at night or if you do snack at night, what are your go to’s? The biggest tip for not snacking at night might surprise you- it’s go to bed early! 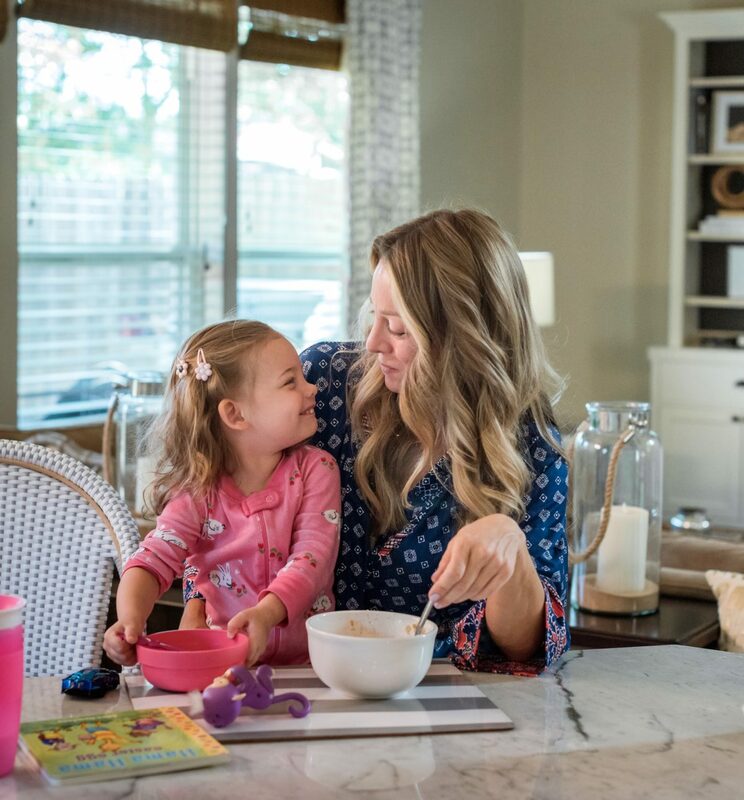 But, if that’s not your routine, I sometimes eat a small bowl of cereal at night or have a piece of chocolate after dinner- or sometimes hot cocoa. If I’m hungry I will eat, but if I’m just barely hungry I’ll make hot peppermint tea. I usually drink hot tea before bed anyway! Is there a place to order one small bottle of the muscle egg to see if you would like it? Thanks Leann! I appreciate that!! Love those crop joggers and just ordered myself a pair! I’m petite like you and the length looks perfect! Thanks! They really are a great pair- super versatile! Great ideas…..everything looks so yummy! 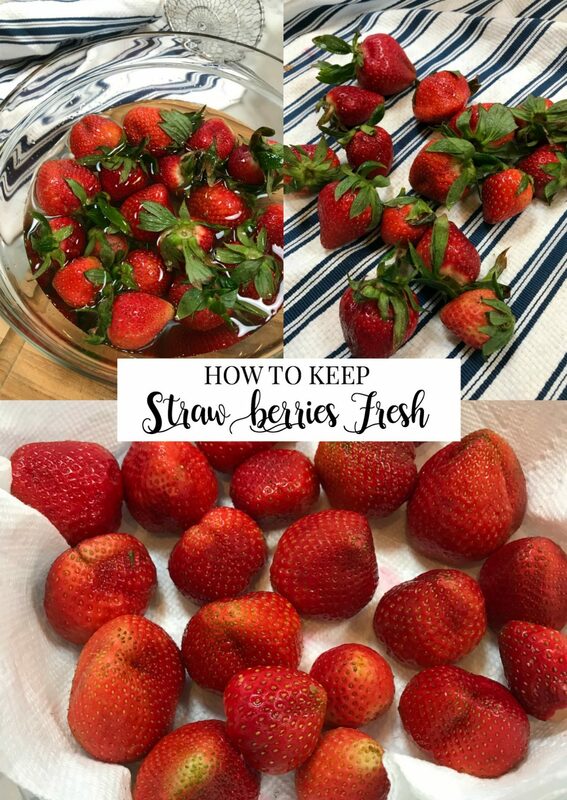 Love the tip for keeping berries fresh, can’t wait to try that. I love the Skinnytaste website for meal ideas. I try to get more veggies in with snacking and just discovered a pretty good dip……fat free plain greek yogurt with Knorr Vegetable soup mix stirred in. Thank you so much for sharing what you eat! You can’t go wrong with apples and peanut or almond butter, right? 🙂 And I put chickpeas in nearly every meal, they really go with everything! Please don’t get me wrong: I personally think that you are consuming a lot of animal protein (eggs, chicken, dairy)! there are so many plant based options (whole foods or powders from vega or garden of life) that are way more beneficial for your health, skin, stomach, the environment – and for animals, too 🙂 win-win! Not boring at all! Have you ever had the little calcium chews? they come in chocolate or Carmel. They are my evening sweet treat. Also thanks for your recommendation of the Kodiak cakes, I found it at Target and my whole family loves them! Also have you very tried coconut oil in your coffee instead of creamer? Or an egg. I just blend in my Ninja. It’s creamy and you’ll never miss creamer. Viactiv is the brand name of the calcium chews I mentioned. I had to look it up. I prefer the generic Walgreen brand and we like carmel best. It’s just my trick for when I need a bite of something sweet in the evenings! Love all of the tips/recipes you included! I love the food/fitness post. I get so many ideas even if they are simple. I tend to get in food ruts, usually because I over complicate it. I’m striving for fat loss/ athletic look like you so its always good to see how someone lives that lifestyle. Have you tried the Chocolate Hummus from H-E-B? It sounds gross initially because it is chickpeas and cocoa, but it is really good! Pretty low in calories and you get your chocolate fix. I like it with apple slices. I like a lot your sporty outfits and honestly I admire your tonic body and muscles, if this is result of your diet and exercise probably I’m going to copy you!!! How do you make your protein pancake? I used to make an oatmeal years ago, but completely forgot the recipe (I never wrote it down). Love the post- more like this please! What seasonings do you use on your chicken ? I can never get it just right! Great post! I love love love that yellow tank! I am in oatmeal eater too. 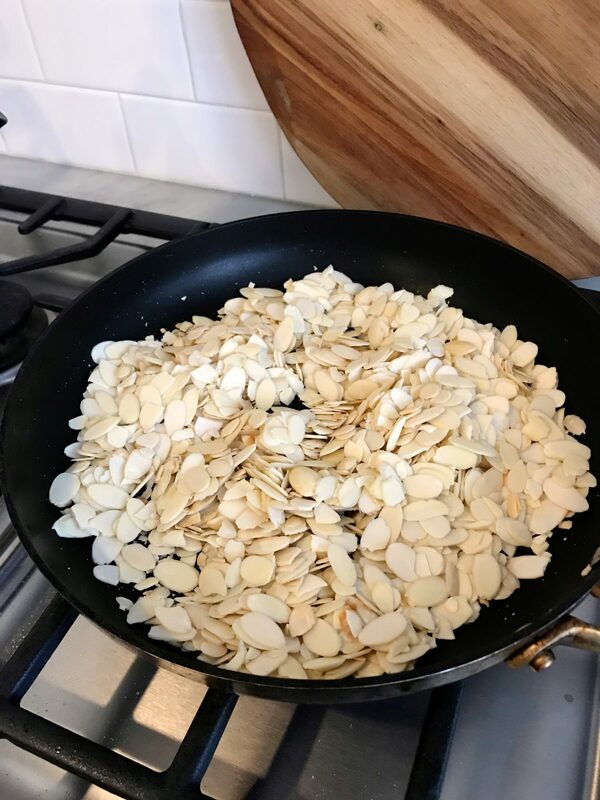 I also will toast some slivered almonds, but I also will toast some Pepino seeds. Try them sometime- delicious. Thank you for making this post. Im at that point where Im sick and tired of being sick and tired of how I look and feel. The thing is that I HATE cooking with a passion, so we tend to eat out; a lot and usually the foods are very unhealthy. If I meal planned, it wouldnt nearly be as bad. Whew, lawd does my body show it too….Im going to check out the egg muscle shake. I know if I lack nothing else, it’s discipline, so I need to get my act together. Do you have an exactrecipe for the homemade muscle egg? I’m interested in making it! All of those outfits we’re so cute and the meals looked so good! When you use the vinegar/water soak on the fruit do you notice the vinegar taste afterwards when you’re eating the fruit? That’s something I’ve always worried about when I see that method. Great post! Thank you so much! I will try this with our berries…and thank you for recipes too! Love the joggers! Question – what are your favorite socks to wear with all of your athleisure stuff? I need new no-shows for my gym shoes and also for my ‘fashion sneakers.’ What do you recommend? Thanks! Thanks for sharing! Chicken salad and oatmeal looks yummy! Also love those joggers! Very cool. You sound just like me Angela because I have a big sweet tooth too! I can often get away with a couple squares of dark chocolate which is so much better than a pint of ice cream! Also, after lunch, I’ll have a piece of gum and that actually helps curb my sweet tooth some! You can do it!! Thank you for linking the higher-necked sports bra. I’ve been looking for one both to keep me tucked in and to offer a little bit of protection to my chest from the barbell. I also love Zella and the price and reviews are great on this. Ordered 2 to take advantage of the special pricing. 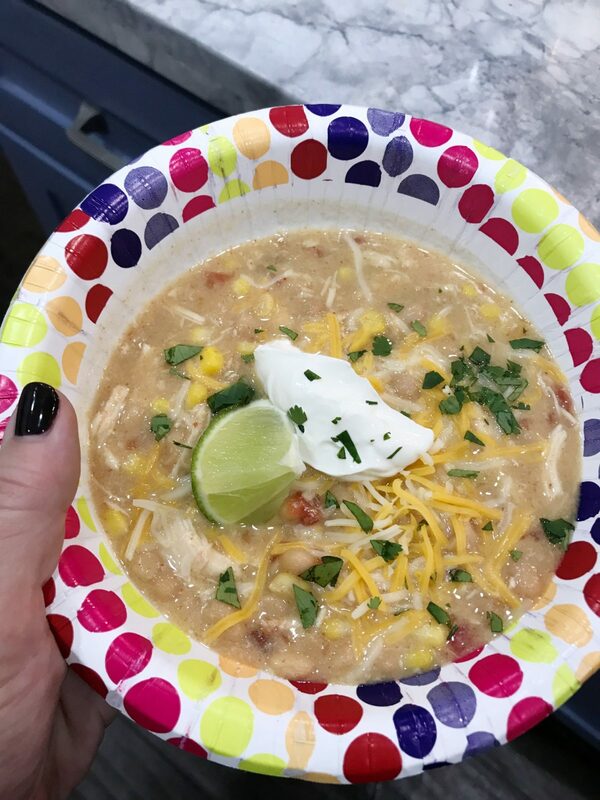 I have made your oatmeal recipe (3x’s now) & just recently made your white chicken chili. LOVE both of them! My husband loves the chili also. 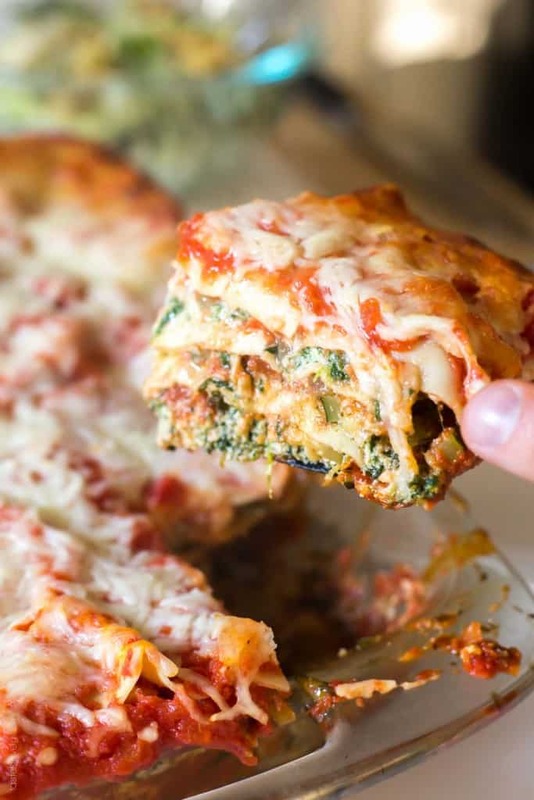 Going to try your veggie lasagna next! One of my “go to salads” is spinach & romaine lettuce topped with diced green apples, chopped pecans, feta cheese & dried cranberries. 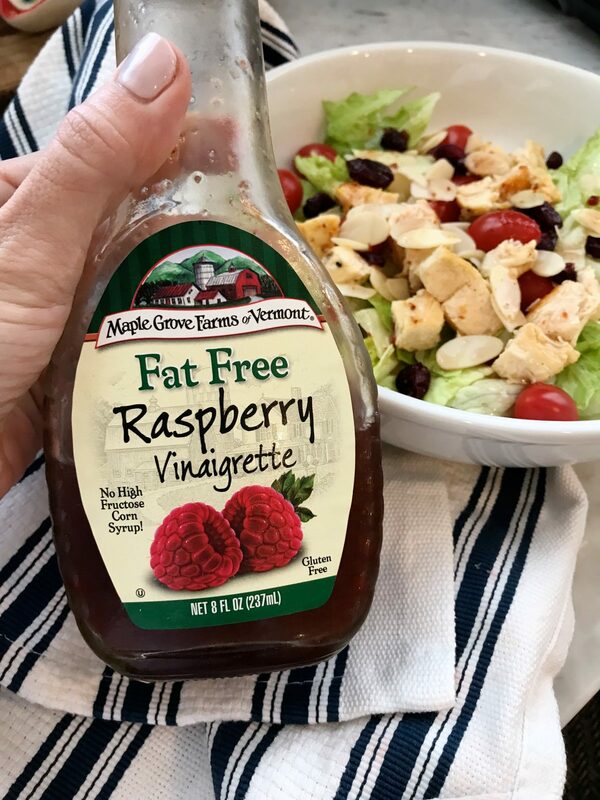 I top it off with Marzetti’s Simply 60 vinaigrette red wine Italian dressing! So good!! 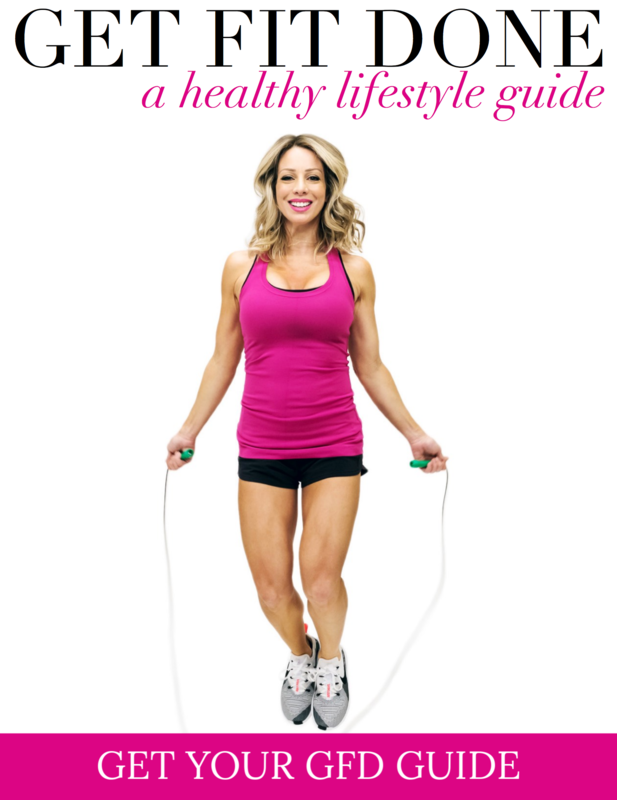 I go to a body sculpting class 3 x’s a wk & I’m always looking for new healthy recipes. Could you share your protein pancake recipe? 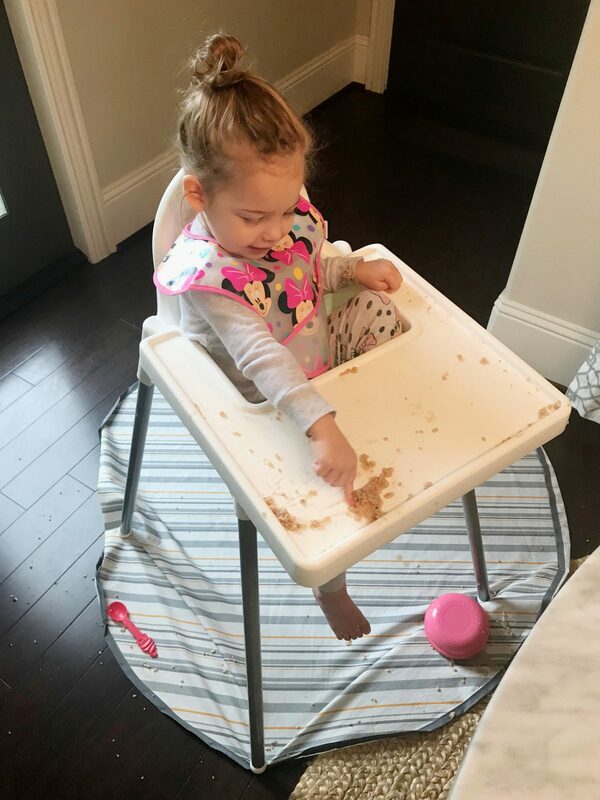 This girl loves oatmeal & pancakes!! 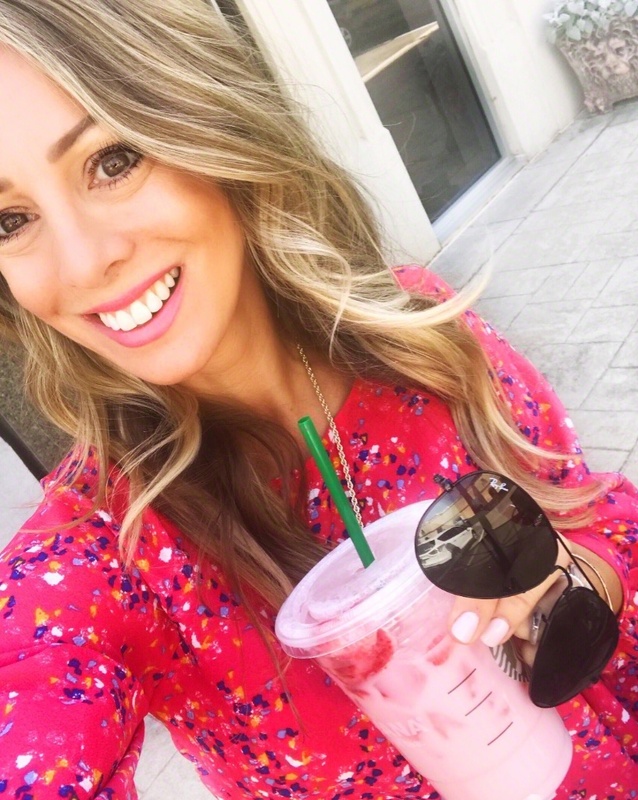 I also love your blog!!! Thank you for all the great things you share! !